� 2016 Forest & Wood Products Australia Limited. The work is copyright and protected under the terms of the Copyright Act 1968 (Cwth). All material may be reproduced in whole or in part, provided that it is not sold or used for commercial benefit and its source (Forest & Wood Products Australia Limited) is acknowledged and the above disclaimer is included. This research task was established to obtain new data to inform opportunities to further improve the thermal efficiency of light-weight, timber framed, small to medium scaled buildings. 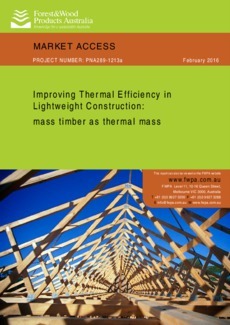 The principle task of this project was to complete an empirical study assessing the measured thermal performance of mass-timber. This empirical study, within real buildings, could then be used to corroborate previous published building heating and cooling energy simulations, which had shown significant thermal performance benefit when mass-timber was substituted with standard framed systems, and concrete and clay brick thermal mass systems.